I couldn’t help but keep the comic book character theme going until the last day. 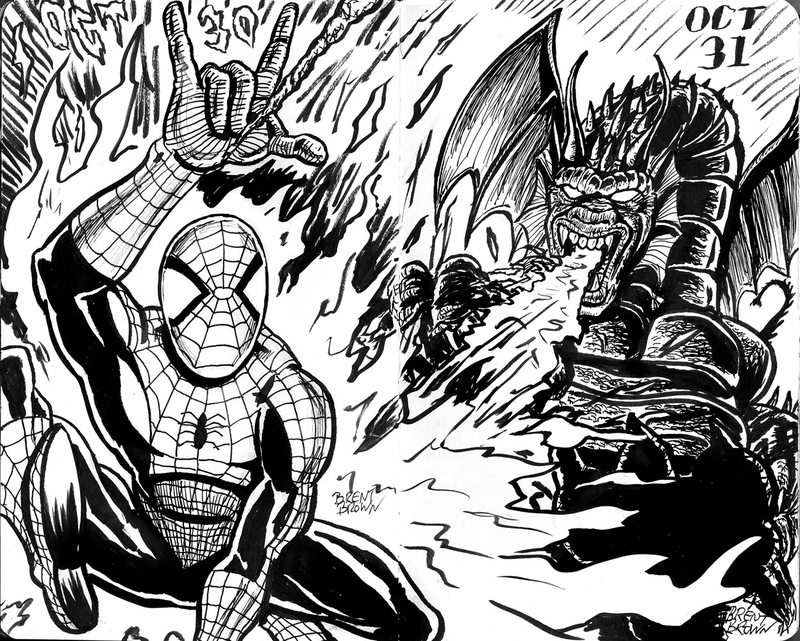 Spider, of course, made me do Spider-man, and he is fighting on the next page, Iron Man villain, Fin Fang Foom! for the dragon. 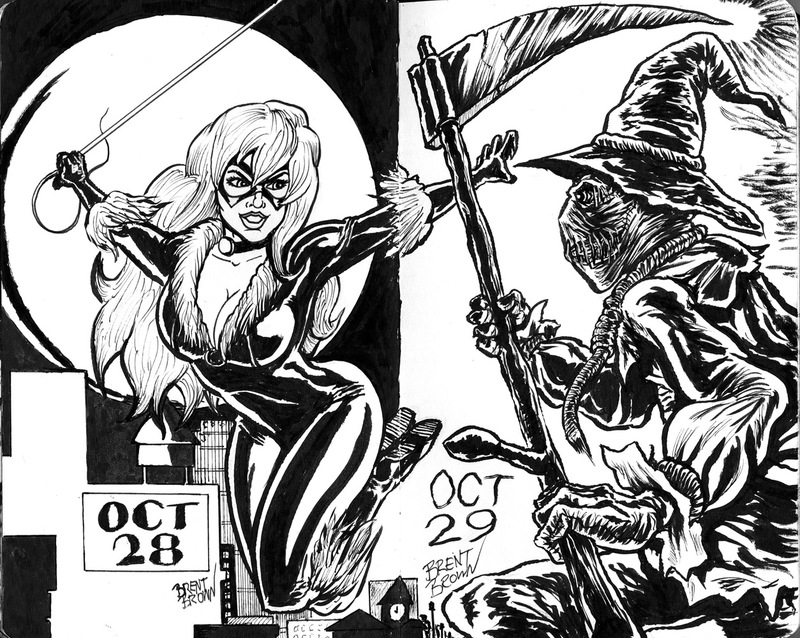 That was an enjoyable exercise that, though tedious at times, kept me drawing for a full month and produced some good work. I will likely try to do it again next year! Yay! More easily-made-into-comics-characters prompts! 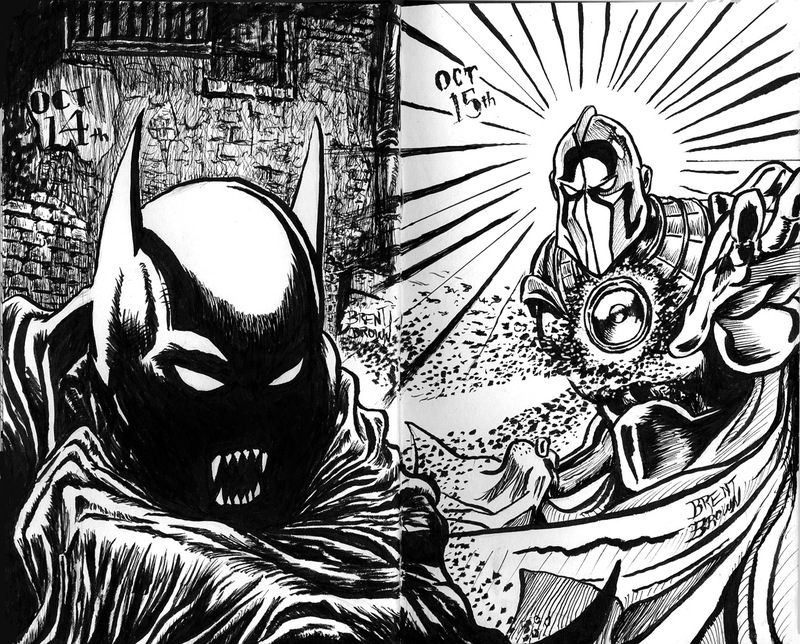 One Spider-man villain (Felcia Hardy AKA The Black Cat) and one Batman rogue (Dr. Jonathan Crane AKA The Scarecrow) gives a nice bi-partisan Marvel/DC feel to this spread in the sketchbook. 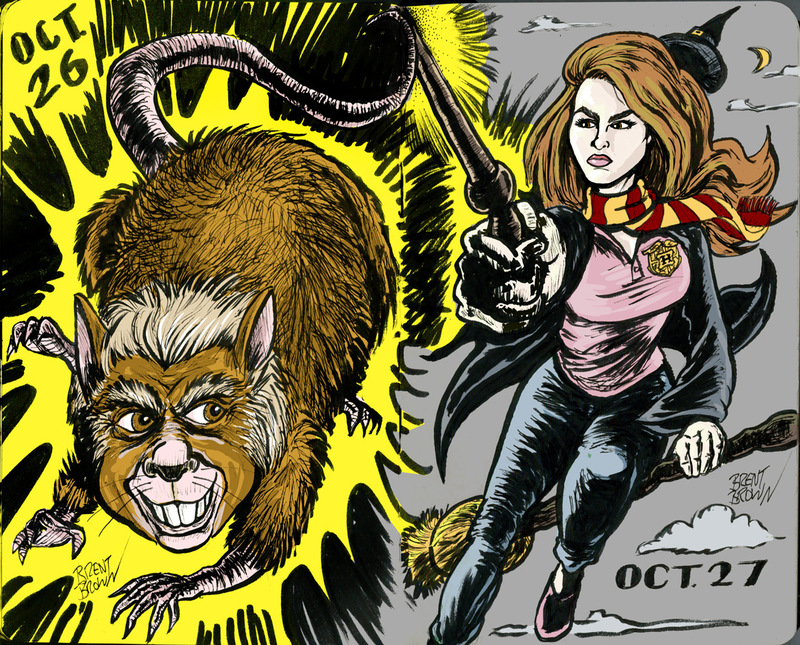 Making shape-shifting rodent-man, Peter “Wormtail” Pettigrew and student-witch, Hermione Granger go together in one spread was not a magic trick. How about these JOLLY RANCHERS? 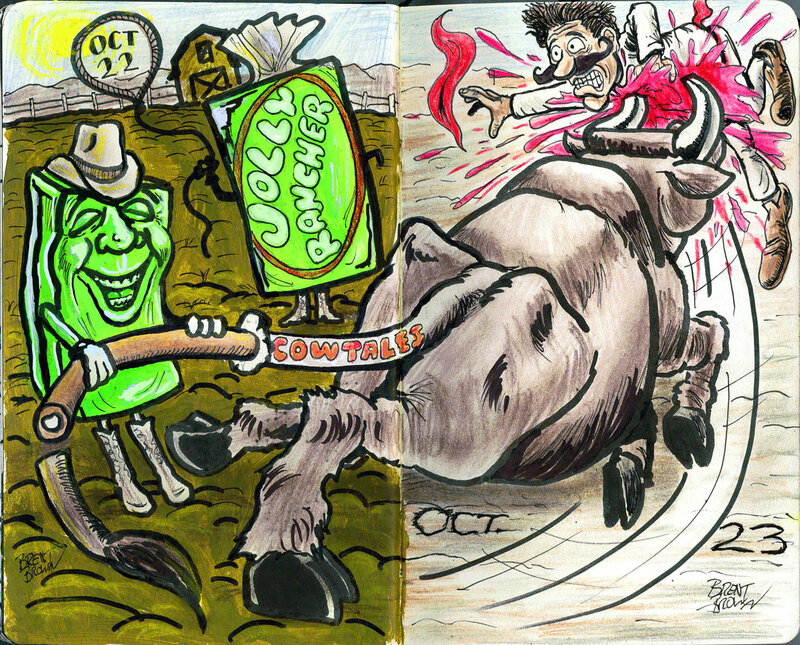 They seem to be pulling on a COW TALE! This was a fun one to come up with. 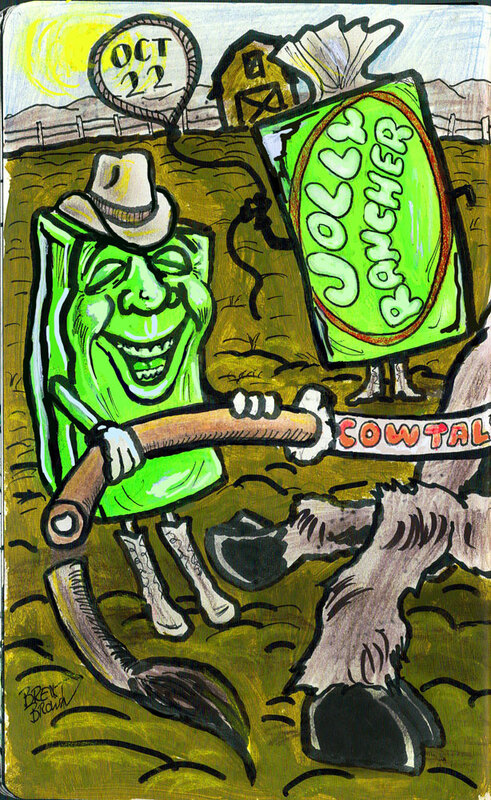 Combining two candies in a bucolic scene that would later link to the next day’s less-wholesome prompt…. 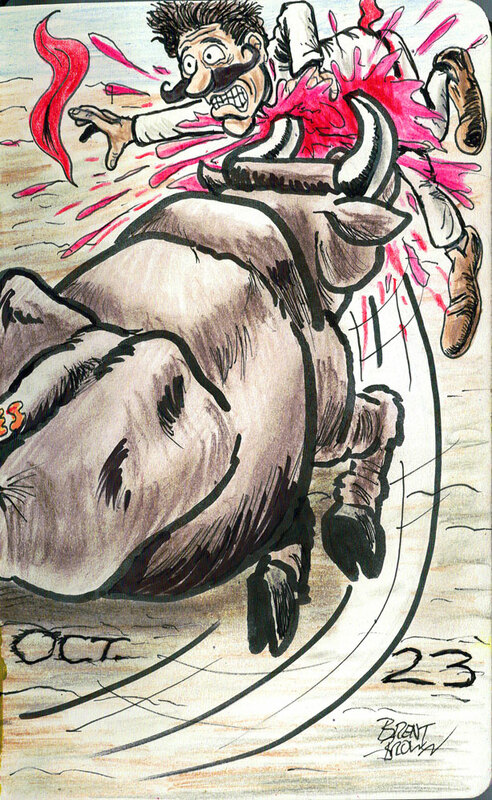 I’m sure the prompt was meant to be the noun, GORE, not the verb GORE, but I went this way to both be different, and to have the Cow “TALE” from the previous page belong to a bull goring the unlucky runner wearing the traditional attire for Pamplona Spain’s famous “Running of the Bulls” event. 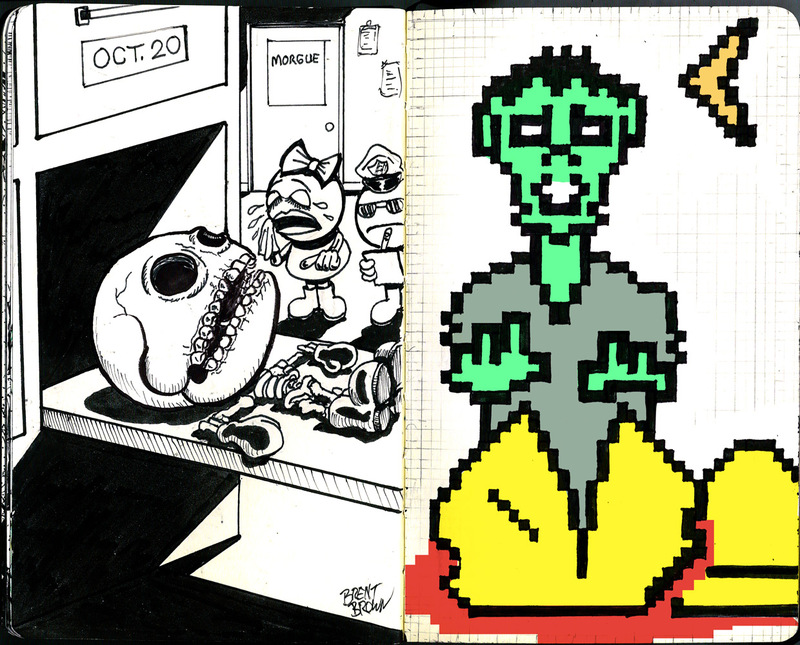 Thinking ahead about how to link these two prompts, I made the “SKULL” belong to Pac Man and had the grieving Ms. Pac Man identify said skull, as well as the rest of the classic arcade game character’s skeleton at the morgue, helped by a Pac Policeman. 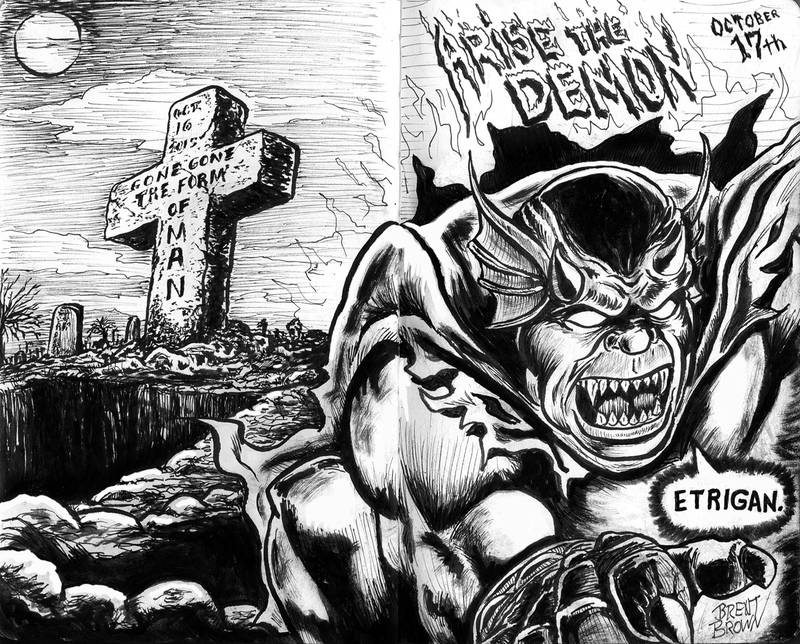 This seemed okay in black and white, but then next day was 8-Bit Zombie and that really cried out for some color. The irony is, I drew the “pixels” out by hand in the sketchbook (making a grid out of light pencil lines) and did the color digitally on the computer. The now-dated 8-bit look of classic video games gives us a pixelated zombie that had just bitten Pac-Man, giving us a flashback to how he came to be dead in the morgue the day before. 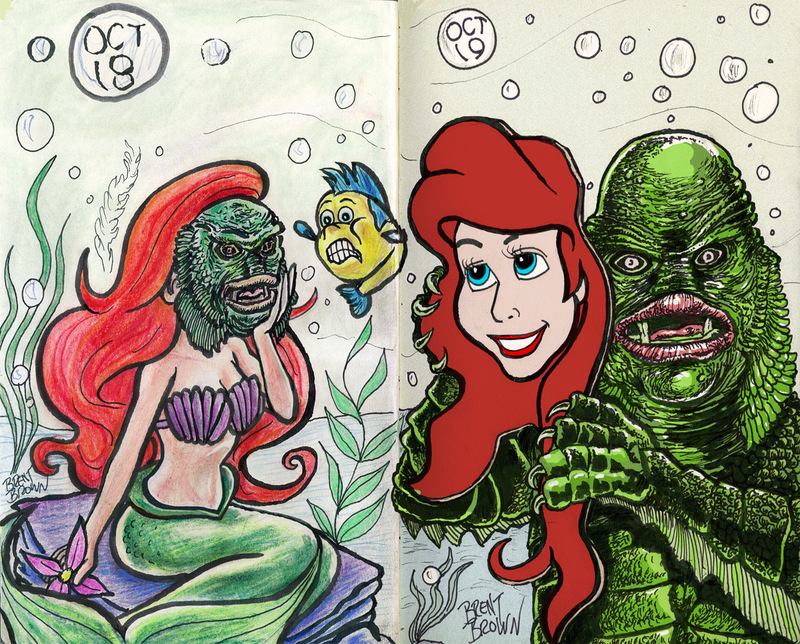 Day 18 is pretty wide open, but knowing that I was going to have to combine it with Day 19, which is pretty darn specific, I chose to make another switcheroo and have Ariel, Disney’s Little Mermaid with a Creature mask on 18 and the Creature with an Ariel mask the next day. Making “bat” into Batman is not that clever, as many did that. I tried to go further by making him a vampire Batman. Then, wanting to combine DC characters, added Dr. Fate and his amulet to fight the supernatural creature. I combined these into one drawing, as moon by itself if pretty dull. 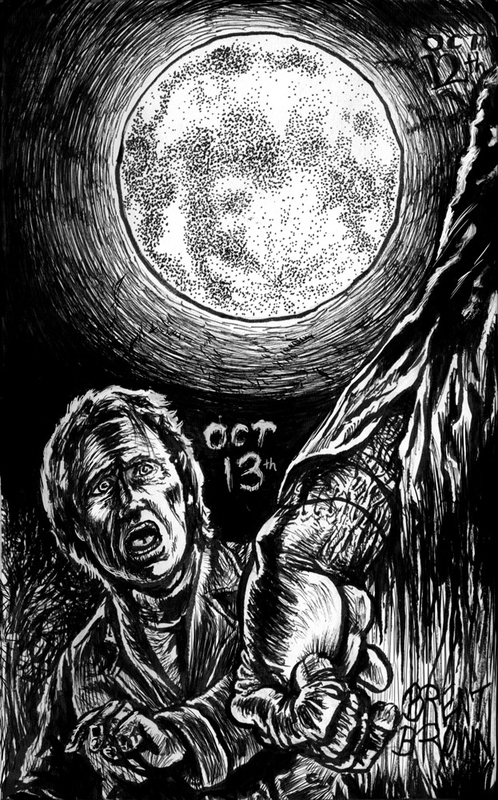 Also, I am a bit of a pedant with some things and calling the “creature” that Dr. Frankenstein brought to life in the story “Frankenstein” just bugs me and I made sure to put the doctor center stage in the drawing, or at least sharing it with the moon, and the creature’s arm just coming into the foreground. 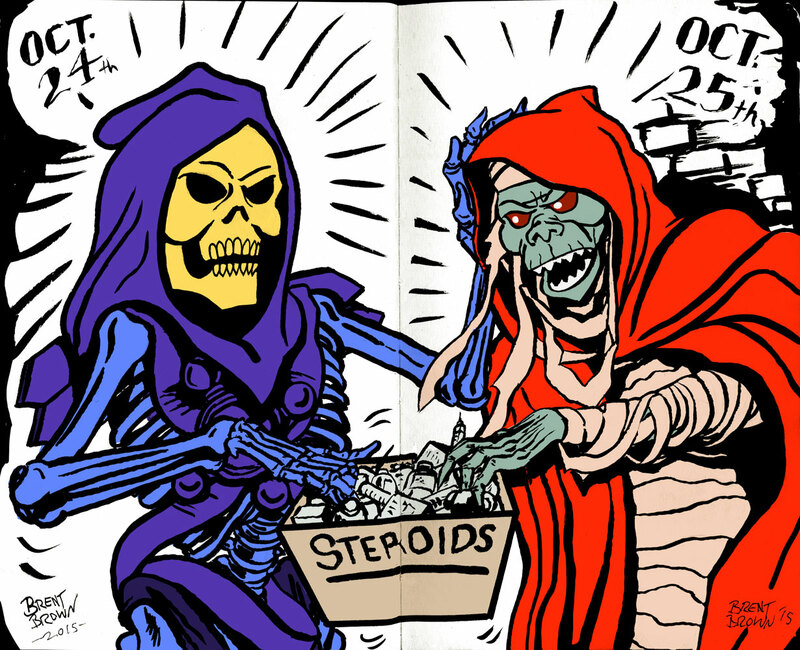 This is the first and last one-page combination of days, from now on they will all be two-page spreads (and to save time, two-day topics covered in singular posts).